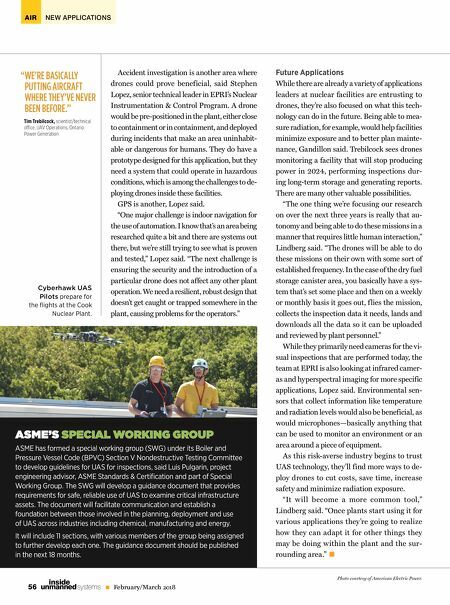 AIR NEW APPLICATIONS 56 February/March 2018 unmanned systems inside Accident investigation is another area where drones could prove beneficial, said Stephen Lopez, senior technical leader in EPRI's Nuclear Instrumentation & Control Program. A drone would be pre-positioned in the plant, either close to containment or in containment, and deployed during incidents that make an area uninhabit- able or dangerous for humans. They do have a prototype designed for this application, but they need a system that could operate in hazardous conditions, which is among the challenges to de- ploying drones inside these facilities. GPS is another, Lopez said. "One major challenge is indoor navigation for the use of automation. I know that's an area being researched quite a bit and there are systems out there, but we're still trying to see what is proven and tested," Lopez said. "The next challenge is ensuring the security and the introduction of a particular drone does not affect any other plant operation. We need a resilient, robust design that doesn't get caught or trapped somewhere in the plant, causing problems for the operators." Future Applications While there are already a variety of applications leaders at nuclear facilities are entrusting to drones, they're also focused on what this tech- nology can do in the future. Being able to mea- sure radiation, for example, would help facilities minimize exposure and to better plan mainte- nance, Gandillon said. Trebilcock sees drones monitoring a facility that will stop producing power in 2024, performing inspections dur- ing long-term storage and generating reports. There are many other valuable possibilities. "The one thing we're focusing our research on over the next three years is really that au- tonomy and being able to do these missions in a manner that requires little human interaction," Lindberg said. "The drones will be able to do these missions on their own with some sort of established frequency. In the case of the dry fuel storage canister area, you basically have a sys- tem that's set some place and then on a weekly or monthly basis it goes out, f lies the mission, collects the inspection data it needs, lands and downloads all the data so it can be uploaded and reviewed by plant personnel." While they primarily need cameras for the vi- sual inspections that are performed today, the team at EPRI is also looking at infrared camer- as and hyperspectral imaging for more specific applications, Lopez said. Environmental sen- sors that collect information like temperature and radiation levels would also be beneficial, as would microphones—basically anything that can be used to monitor an environment or an area around a piece of equipment. 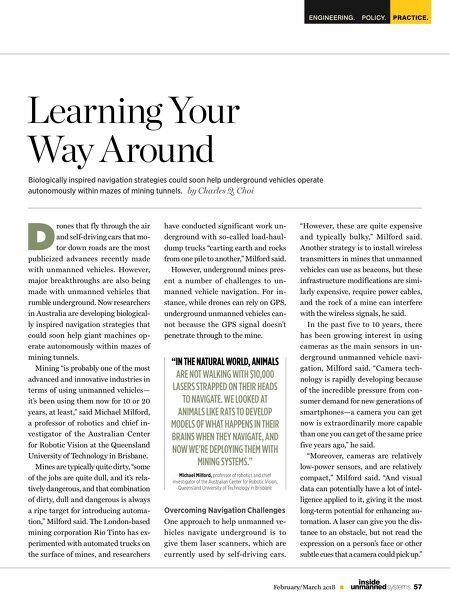 As this risk-averse industry begins to trust UAS technology, they'll find more ways to de- ploy drones to cut costs, save time, increase safety and minimize radiation exposure. "It w ill become a more common tool," Lindberg said. "Once plants start using it for various applications they're going to realize how they can adapt it for other things they may be doing within the plant and the sur- rounding area." ASME'S SPECIAL WORKING GROUP ASME has formed a special working group (SWG) under its Boiler and Pressure Vessel Code (BPVC) Section V Nondestructive Testing Committee to develop guidelines for UAS for inspections, said Luis Pulgarin, project engineering advisor, ASME Standards & Certification and part of Special Working Group. The SWG will develop a guidance document that provides requirements for safe, reliable use of UAS to examine critical infrastructure assets. The document will facilitate communication and establish a foundation between those involved in the planning, deployment and use of UAS across industries including chemical, manufacturing and energy. It will include 11 sections, with various members of the group being assigned to further develop each one. The guidance document should be published in the next 18 months. " WE'RE BASICALLY PUTTING AIRCRAFT WHERE THEY'VE NEVER BEEN BEFORE." Tim Trebilcock, scientist/technical office, UAV Operations, Ontario Power Generation Cyberhawk UAS Pilots prepare for the flights at the Cook Nuclear Plant. Photo courtesy of American Electric Power.